Through this blog I’ve been lucky enough to meet a lot of people that have given me a lot of insight to many of the questions I ask in my writings. When I first started this blog I made a promise to myself to learn more about Kiribati which means I have read lots of articles, met lots of wonderful people and discovered new organisations. There are a lot of smart, passionate people out there contributing significantly to Kiribati and the rest of the Pacific Islands and I find this very inspiring! So this post is dedicated to the many people that contribute to the islands. Either on Kiribati or abroad, their work is dedicated, educational and a real bonus to Kiribati. Although there is no way at all for me to list the amount of people and organisations have Kiribati’ best interests at heart, here are a few that I think are absolutely fab. The Pheonix Islands are one of the three clusters of islands that make up the nation of Kiribati (the other two being the Gilbert Islands and Ellice Islands). US marine scientist Greg Stone played a key role in making the Pheonix Islands a protected area, the second largest in the world. This is protecting the reef, the atolls and sea life in the area and is contributing significantly to maintaining one of the most beautiful oceanic areas in the world. Or watch Greg Stone speak about the project here. However you feel towards Kiribati’ president – Anote Tong – you have to admit that his government have done a lot of campaigning for the future of Kiribati in regards to rising sea waters and climate change. A great government initiative is the Kiribati Adaptation Project which works with leading international scientists and engineers to try and find solutions to the lack of fresh water and rising water levels. I met the project manager for this initiative when I was there in December and although Kiribati has a tendancy to be quite slack and lazy, the people working for this are well educated and are determined to contribute to the country’s future. Although a much smaller organisation then the above but well worth the mention. This group work very hard in maintaining the Kiribati culture for those that live in Melbourne. They are constantly organising parties – let’s face it, the Kiribati people love any excuse for a botaki!! – and these parties are usually fundraising for groups or societies in need over in Kiribati. Their last event raised almost $3000 for the Tarawa Hospital. They also provide a Kiribati family for those missing the islands, organise dancing groups and support other organisations contributing to Kiribati. Thanks guys! Call me a little biased but this is a little shout out to my Dad. My Mum and Dad have been married for 30 years and they met on Tarawa when Dad was commissioned to start the Kiribati Police Band in 1979. Although living in Australia, Dad has always provided the Police and KPG bands with music and support; he writes out the national anthem, hymns and marches for all their official events and always pops in whenever he is on the island. Just this year, Dad has organised for the Police band to gain more instruments. 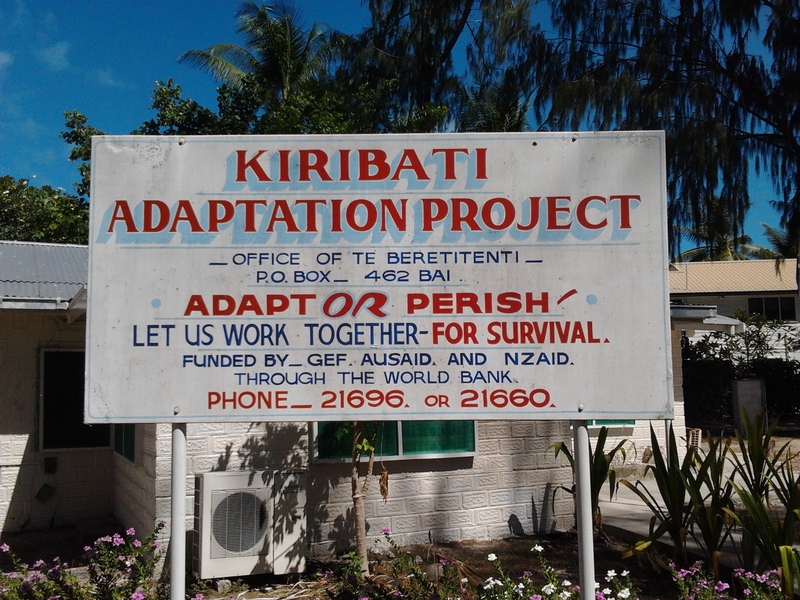 Its people and groups like this that help keep Kiribati running. Kiribati is a tiny and poor nation and every little bit of help they receive is priceless. So after my list, I’d like to hear yours. I’d love to hear more about all the different groups and individuals that give their time to preserve Kiribati’ beauty and culture. Previous Post Kiribati relocating to Fiji? Next Post Aren’t we all the same? Great list Ta and I love the last snap! Great photos and sentiment! I too especially love the one of your dad. He sounds an amazing man 🙂 I lived on South Tarawa for five years (between 1991 and 1996) with my husband, daughter and son – in fact, my son was born at Nawerewere hospital. My husband taught at KGV and I did various jobs, including working at Tarawa Teachers College. 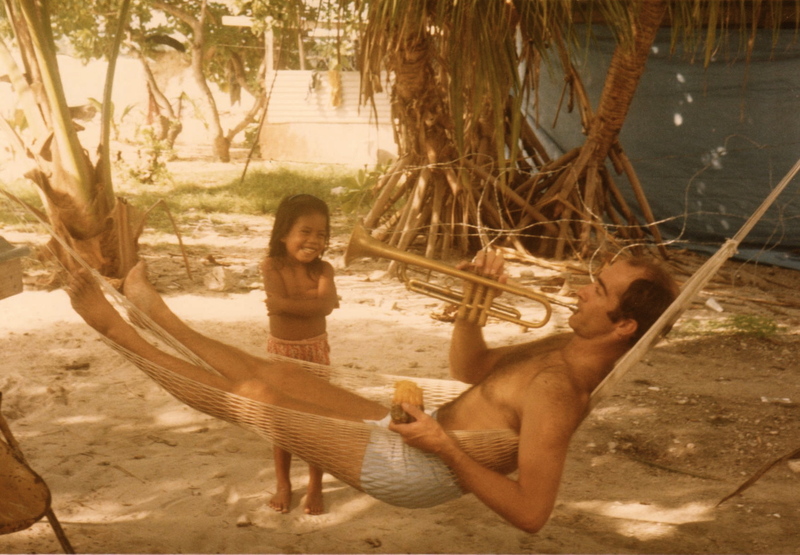 We loved living on Tarawa and were very sad to leave because the place had become our home. I feel very privileged to have lived in one of the safest countries in the world and one of the loveliest, and to have met so many very honest, kind and friendly people. I’m hoping to give a little something back in the shape of the book I am writing, a crime novel is set on South Tarawa, and which I hope shows Tarawa and the Republic of Kiribati to be a very unique and special place! The book (called Food of Ghosts) is due out later in the year. I don’t know if I will succeed in doing this, but I’m going to try! Thanks again! Wonderful yet again Marita. Is that you with your dad? Marianne, I’m looking forward to getting my hands on your book when you’re done. 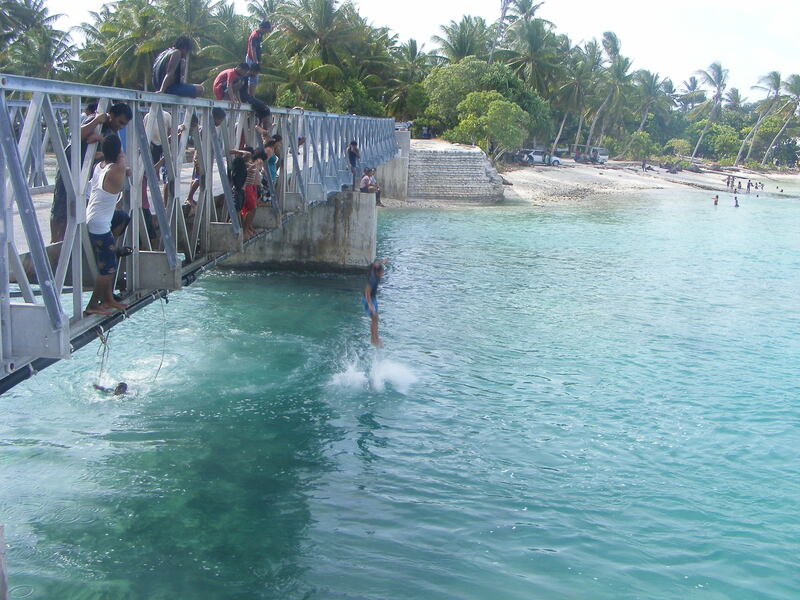 Photo’s of the bridge are taken at the bridge in Buota heading onto over to the North Tarawa side. The bridge had a major upgrade 3 years ago. And the second picture is my Dad playing for my Mum’s youngest sister – Bebe – who is only 5 years older than me! This would have been just after Mum and Dad got married in 1982. Dear Marita – shout out to YOU & YOUR MUM. Adding to your list, for the experience you freely share here in blogging. Now I’ll be biased, my mother Tongafiti and father Norman Cross, have spent 70% of their lives up there in Kiribati. Their five adult children (myself being the oldest at 46 yrs) have migrated to Melbourne. They have buried two son’s, one who drowned in Tuvalu in 1973 and another who passed away in his mother’s arms in 1994. They have 12 grandchildren living in Melboourne. They could easily take the high life and gone anywhere in Australia to live – ordering us kids around. But they choose to stay in Tarawa. My father stays there to be with his sweetheart. Yes, he would love to nick down to a supermarket chain to get fresh cheese, milk, butter, fresh vegies and fruit – all for the price of one big pumpkin and a cabbage in Kiribati. However being able to teach men how to build sound structures, houses and seawalls, is worth the sacrifice of living off fish and rice. He is the 2nd non-Kiribati to get their Order of Merit (OMK) at Independence, just before he retired in 2007. Now he spends his time skyping from his hammock on their verandah in Urano. The OMK has disappeared, because it has been misplaced, but his advice to young builders, is still freely given. Mum reckon’s the Government was being nice when they gave dad the medal, “they meant it for me”, reminding him if it wasn’t for her, “he would be another useless man stuck in Australia”. Now this might sound racist and demeaning, but this is why my mum should also be on your list. She is upfront and vocal. “Too straight forward” – “tia mwamwa irouna!” many have said. But more than most, even men, come to mum to present a case and ask her to accompany them to stand for their issues. Most seek support for their issues on domestic, religious, political and social standings. The international arena is filled to the brim with people hypocritically saying they want to help the ‘developing nations’ and proceed to drive through another takeaway chain, yearning for a better model vehicle or the latest fashion trend. My parents have turned their backs on that, opening their home in Tarawa for anybody, and we mean anybody, to ask for help. Dad has sustained my mum in giving everything they have in ‘bubuti’. There is no pension for my mum, as she has never ‘worked’. But ask anybody in all the islands and they validate “she works too hard”. More names for your list and if you want details I can offer, but thought it might be just as good for you to ‘put it out there’ too. Have other’s sing praises for these incredible people. That’s just a few names. Really enjoy reading your blogs. Please don’t stop.